Most writers I know, hate writing a bio. 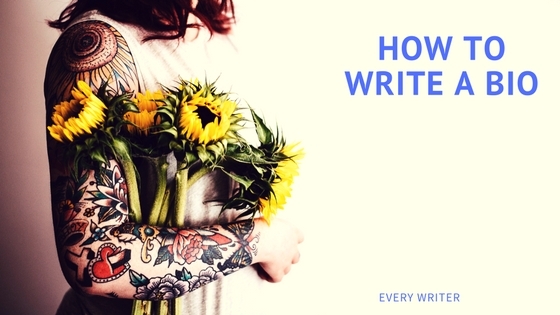 So this is how to write a bio, and it is to help those writers who are just starting out and anyone having trouble. I’ll say this many times: this is friendly advice. It’s always difficult to write a bio. Most of use really do not like to write about ourselves, so no matter how long you do this for it will always be a bit awkward. You might want to write a bio for the editor, or you might have published a piece and want to publish your bio to go with it. Either way, I get 2 main questions about this, but remember there is nothing written in stone. 1. First, what do I do if I haven’t published anything? The first rule of writing a bio is be honest. If you are submitting work to an editor, just know, I do check up as best I can on what people say. If you say that you have been published some where, I usually go looking. If you lie in your bio, it will disqualify the publication many times. Other times you simply do not get a bio. Thomas Wright holds a BFA in writing from the University of Something. He is a librarian in Someplace Ohio. (Or he lives and works in Ohio). It is acceptable to say he works as a librarian and lives with his wife and 3 cats in Ohio. No reason to get fancy! Also, make please write them in the 3rd person! Mike Ward is a truck driver. He lives and works in Dallas, TX. Allan Ward holds a BFA in writing from UCLA. He teaches English at Watchano High School in Dallas, TX. He lives with his wife and 4 dogs. Sarah Ward is a Marketing Director living in Dallas, TX. She teaches and spends time with her pet monkey. Melissa Allan lives and teaches in Ohio. 2. What if I have published a lot? The template for publishing a lot is the same. Name, education and OR profession, awards, publications and place . Do NOT go overboard in listing your experience or publications. Don’t say “widely” or “extensively” published. Saying many more at the end is more than enough. It is hard to say what the best publications to list are. You want the best know and most prestigious. You can look at our top 50 list (http://www.everywritersresource.com/topliterarymagazines.html). Otherwise stick to the ones that are best know. Try to keep a max of 6 publications. Mike Ward is a truck driver who holds a degree from Southern University. He has published work with Green Hat, Wow Magazine, Topland, Holy Cow, Whoa, and many others. He lives in Dallas, TX with is wife and 3 children. Sarah Ward is an Account Executive in marketing. You can read her work at Green Hat, Wow Magazine, Topland, Time Time, among others. Melissa Ward is a belly dancer who holds a degree in Physics from UCLA. In 2012 she was awarded the What the Heck writing award. She has work forthcoming in Green Hat, Wow Magazine, Topland, Holy Cow, and her work has appeared in many other publications. She currently lives and works in Cleveland, OH. Most of the time you simply want to be as professional as possible. The best way to write a bio for a certain publications is to read the bios they have already published. If you are sending something to an editor, keep it simply, honest and professional. I have read many outlandish bios. Some stupid, some playful, and some silly. Usually I want something that will make my publication look good and professional. Most outlandish bios I simply omit. SOME editors like that sort of thing, but if you go and read the editors bio, especially if he or she has got a publication in a nation magazine or anthology, you’ll see, even they keep it honest, simply and professional. Yes, every writer should have their own passion to posterized in their bio.. Thanks for the information so creative and inspiring. Greetings. When I initially commented on the Writing Sense – How to Write a Writer& blog I clicked the “Notify me when new comments are added” checkbox and now each time a comment is added I get several e-mails with the same comment. Is there any way you can remove me from that service? Many thanks!